I realize this isn’t Mandarin, but as Mandarin programs are so new we don’t have a lot of long-term data. Spanish is more built out so we have a better sense of how it works. And it does work. 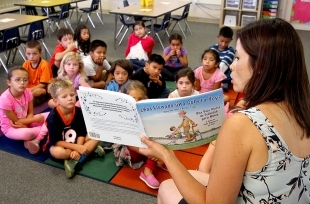 First-grade teacher Angelina Rodriguez reads to her students in Spanish in their Spanish immersion classroom at Escondido Elementary School on Aug. 19. 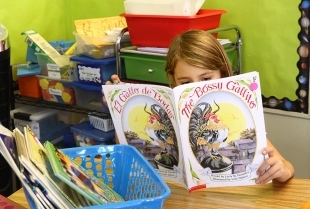 Lessons are taught 90 percent in Spanish and 10 percent in English in first grade at the school. Photo by Veronica Weber. One works on climate change in the White House. 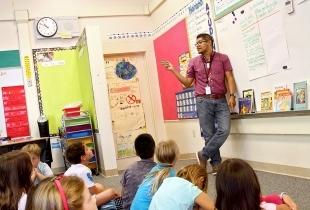 Another started a new job this week as an elementary school dual-immersion teacher. Another is a journalist; another is heading to Chile this fall for a physical therapy internship; and one now serves as program director for DreamCatchers, a local nonprofit that provides after-school tutoring and mentoring to low-income Palo Alto students. The common thread in these seemingly disparate career choices is Palo Alto Unified School District’s Spanish immersion program, from which all of these people graduated from many years ago. The program, which has been housed at Escondido Elementary School since the late 1990s, is celebrating its 20th anniversary this weekend. Students and families from the earliest cohorts of the program are returning from elsewhere in the state and country to attend the celebration, a testament to the deep impact and close ties the immersion program produced. The program’s earliest students, now in their mid-20s, all describe the program as having a lasting impact on their lives that went far beyond simply being able to speak a second language. It developed in all of them an appreciation of language, education and cultural differences that has played out in each of their lives in compelling ways.